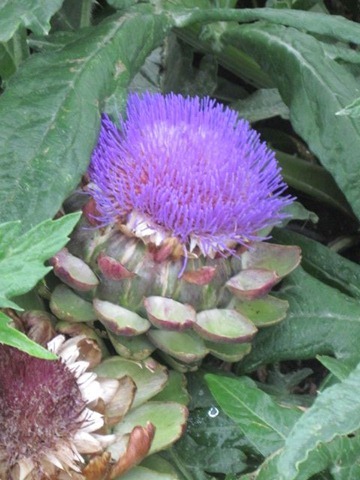 The artichoke is a member of the thistle family and what we eat is the underdeveloped bud. We eat only the heart and the petals; the “choke” is what later develops into the flower. When left to flower, the result is a prickly, purple bud on top of the flower end. Every year I try to grow artichokes…not always successfully. I think I just like the idea of growing artichokes. Here in Summerland, in most years, artichokes are not perennial plants like in the Middle East or even California for that matter but rather annuals. They need a long growing season in a sunny location with lots of rich soil, all of which we have. It is the winters that turn artichokes annuals. Artichokes can be found in the grocery store year round. They are usually huge and hugely expensive. I often wonder who buys them and what they do with them. 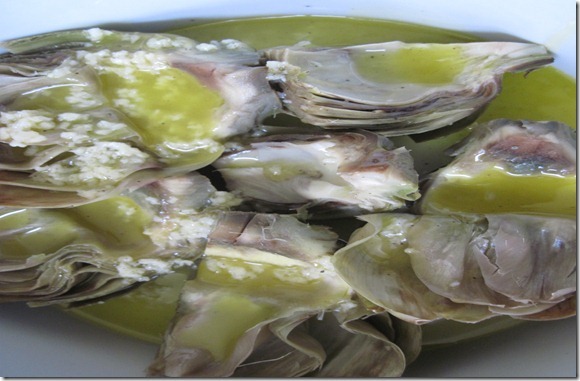 Commonly, we know artichokes to be small, marinated and quartered in jars. That is about as close to artichokes as we get. Down in the cool room I found a bag of artichokes I picked in late October. Well, if that doesn’t bring back memories of hot summer days. I know…I know…you are thinking, “ How did I come to have stored artichokes?” Don’t they go bad? Well, the ones in the stores are not exactly freshly picked. 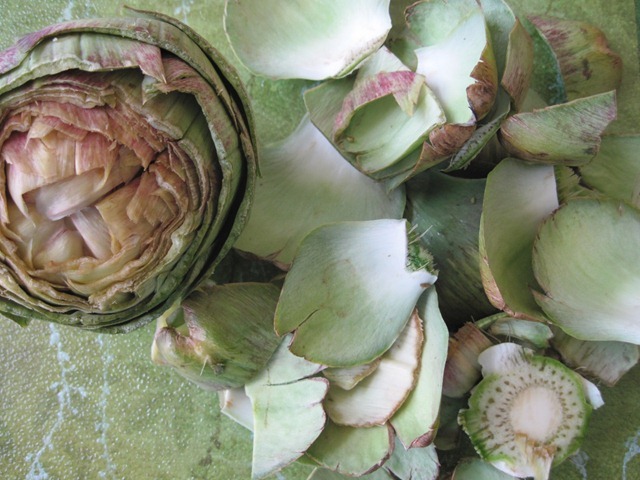 Typically, artichokes are cropped in the spring and then again in October. The size of the artichoke has nothing to do with its tenderness. Artichokes are not a vegetable for today’s fast paced, too quick to be thorough world. They are at the opposite end of the vegetable gardening spectrum as they take months to size up where as lettuce can be eaten almost as soon as it shows its’ pretty head. They require time and patience to prepare. They are near the bottom of the fast food race because they are the antithesis of fast food. By the time an artichoke has been prepared to the point of cooking a mountain of waste has accumulated on the counter. No chickens? Don’t feel bad. Compost. Preparing a raw artichoke for cooking requires a lot of work but it is worth it. 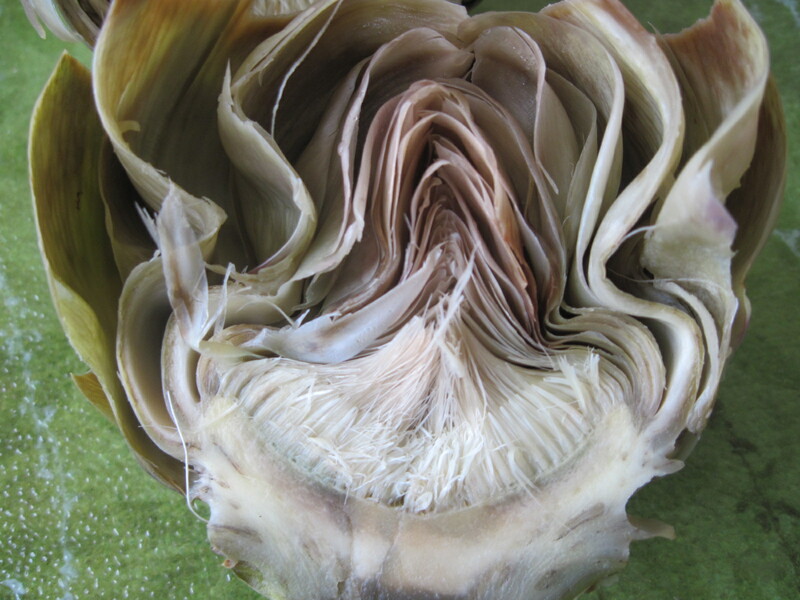 The act of eating an artichoke – of pulling off the petals and scraping the flesh from the rubbery leaves requires time. This is a vegetable to share with friends. It invites conversation. You might start this conversation with, “How did those early Romans discover this relative of the thistle family, was edible?” I am afraid don’t know the answer. 2. In the meantime, cut off stems and top 1/3 of the artichokes. 3. Using kitchen shears trim the remaining petals of their tips; rub lemon over cut parts (other wise they will discolour) ; throw used lemon halves in salted boiling water. 4. Add trimmed artichokes to boiling, salted water. Cover with a clean dish towel to immerse the artichokes in the water. Without the tea towel, the artichokes will float exposing some of the artichoke to the air. The tea towel helps the artichokes submerged. 5. Gently boil until they are tender in the centre when poked with a knife about 25 minutes. Check at 20 minutes for doneness. When done, remove from the water and drain. 6. Whisk together the olive oil, white balsamic vinegar, lemon juice, garlic, pinch of salt in a dish that will hold the artichokes in a single layer. 7. Cut artichokes in half removing the hairy “choke” in the centre, just above the heart. 8. 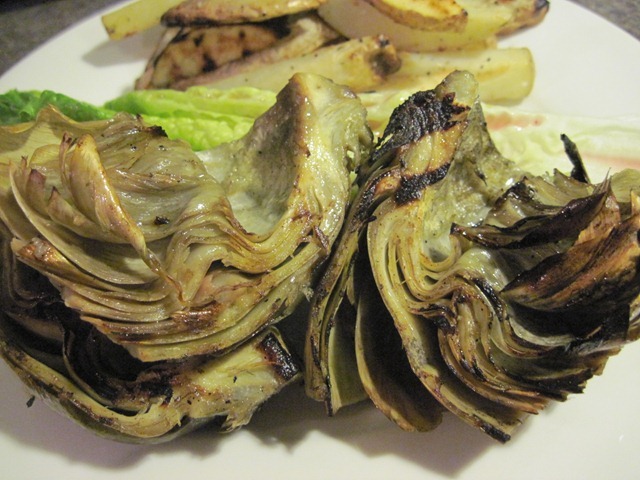 Place artichoke halves in dish and toss to cover with marinade. Set aside for three hours. 9. Drain the artichokes and cook over a hot grill, 4 minutes a side. Go ahead. One by one pull off the petals. Savour the delicate flavour. Finally, gently bite into the heart and eat it in three bites. This is what the Romans discovered. Enjoy. I grew up in California eating artichokes. It is hard to find someone in Alberta who knows what to do with them and/or wants to. Maybe your recipe will help me to re-live some lovely moments at the slow-food table of home, when it give it to my friends after they try my artichokes. 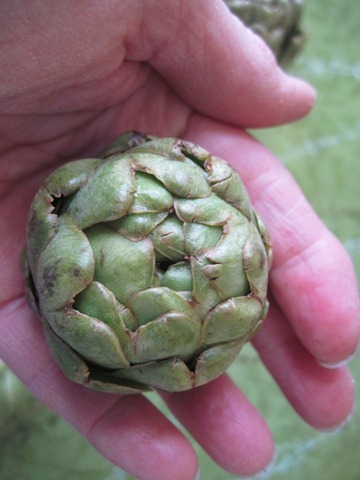 Where do you find the seeds or starter plants for artichokes? It is one of the most fun veggies to eat. i serve them with a lime and cilantro dressing for dipping. Seeds can be ordered on line from West Coast Seeds (www.westcoastseeds.com). They carry three different types: Violetto, Green Globe and Imperial Star. Here in the Okanagan, if the winter is mild enough, they might over winter but generally I have to treat them like an annual.